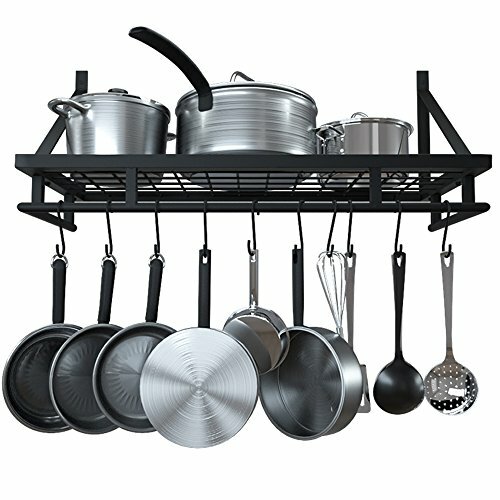 Simple style metallic kitchen pot rack, specially designed for storing pots and utensils, mounts on wall to store, organize, and display your cookware collection in one compact space. The pot rack is made of thick materials, hand-made welding. It can withstand a weight of 30-40 lb. It has been specially treated to prevent rusting. Dimensions of pot rack: 24.5 inches x10 inches x 9.9 inches. with 10 S-type hooks. Multi-purpose shelf, ideal for any room in the house, install in kitchen, pantry, dining area for everyday cookware or bathroom to store drying towels and toiletries. Sturdy center grid does double duty and functions as shelf for books, baskets, toiletries, plants, and many other household items.